As rheologists working in a company that excels in materials characterization technology we are in a strong position to explore the links between particle properties and rheological behaviour. This blog is the first in a series that mines a seam discussed in greater detail in the whitepaper: ’10 ways to control rheology by changing particle properties’ . The focus for today is how to manipulate particle size to influence viscosity. For a suspension with a fixed concentration of solids the number of particles present is directly proportional to their size. So, a specific solids loading can contain a certain number of large particles or a higher number of smaller particles. 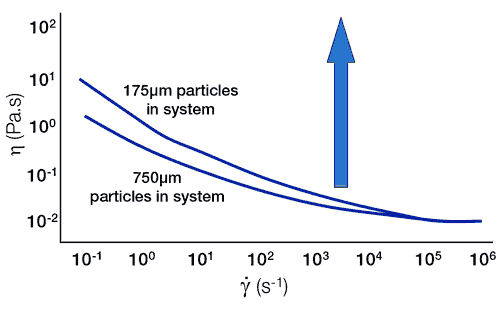 As the number of particles goes up, so does the number of particle-particle interactions – usually resulting in a higher viscosity. However, because particle-particle interactions are relatively weak, this effect of changing particle size can be much more evident under low shear conditions than at higher shear rates. Below are data for a latex adhesive. During this product’s lifetime, optimum viscosity varies according to conditions. Under low shear conditions, such as during storage, achieving relatively high viscosity reduces the risk of sedimentation. However, under the high shear conditions created when applying the product, a glue that is less viscous is easier to use. Changing particle size may be one of the simplest ways to control product viscosity. Moving to a finer particle size delivers the desired increase in low shear viscosity without affecting high shear viscosity. Perfect! High viscosity under low shear conditions is also important for those who prefer their chocolate bars adorned by a rippled finish. More viscous chocolate holds a profiled shape during hardening, without slumping. In the trade, this is referred to as stand-up, for fairly obvious reasons. Manufacturers can achieve the right stand-up by manipulating tempering conditions and emulsifier dosing, actions that influence the stabilised size of particles within the product. Distribution – how changing the particle size distribution of your suspended solids can change viscosity even if median particle size remains the same. Until then, can you share any practical experiences of the particle size / rheology connection?